When I first saw what Vine Saccento was doing with v100 Mod Box, I was impressed. 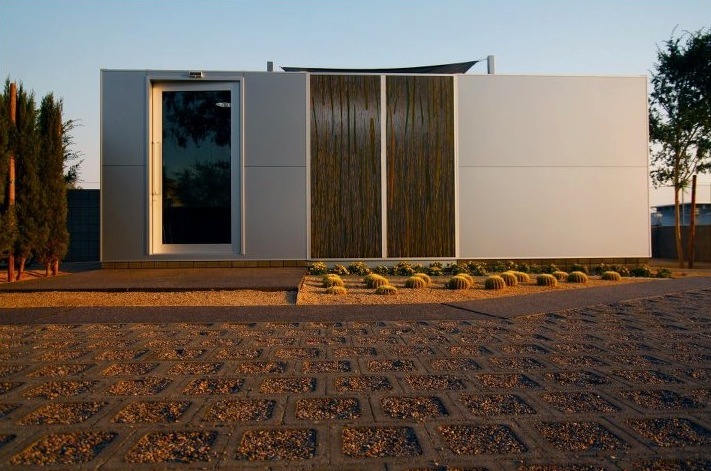 And I’m still impressed as his prototype has been rolled out recently in the form of three prefab homes at the southern end of downtown Phoenix at 749 S. Second Street. One is rented by Tom Kelly, CEO of Schaller Anderson, and designer Saccento is living in another. If Apple were to sell a homes, perhaps they would look something like this. The v100 Mod Box is a 10′ x 10′ x 10′ cube made with green materials, state of the art appliances, and stylish fixtures. It’s a new kind of structure that can be assembled by anyone — no tools required — and lives comfortably despite the fact that its footprint is so tiny.